It's only been a few hours since I've seen the original 1951 version of The Day the Earth Stood Still. Like a lot of people who have seen the remake, I thought the new film was okay with the regular amount of plot holes and exaggerations that always seem to hound Hollywood movies. I read some articles on the new movie and how they were disappointed with this version and how they longed for the older version. As it was, I watched the original version expecting a much better film than Keanu's version or at least a better movie overall. Unlike a lot of movie fanatics, I am not swayed by the idea that the older version always trumps the new one. I do not care about thinking that the original had a lot better plot or had better actors or that they had to make do with what they have back in the day. To put it bluntly, The Day the Earth Stood Still (1951) is a disappointment. The two versions are actually two very different movies. The only thing that they truly shared are the title, character names, the idea of destroying mankind and the anti-climactic ending (the 1951 version trumping the new one on this aspect). The plot line of the original version is this: aliens arrive on Earth because of a couple of recent developments---Man's discovery of Atomic Energy (this is 1951 after all) and Man's recent fascination with rockets and going to space. The two combined is what troubles these aliens. They do not care about the planet and unlike the new film, talk about Earth only as a whole and almost never as Earth and Mankind. They fear that soon, Earth would be arming these rockets with atomic warheads and begin destroying other planets. And so they bring in Klaatu, played by Michael Rennie, a rather less stoic or more human version of Keanu Reeves. The purpose, supposedly was that to tell the world leaders of this problem and that the world as a whole should accept their proposal or risk annihilation. This is where the plot bogs down and yet gets glazed over by every single film critic I've read. The proposal is essentially to stop this scientific development because they would be considered as a threat to the peace and stability of the universe. In a modern day analogy, this is the same as when the US does not want other countries to develop nuclear weapons because they threaten the peace and stability of the world as a whole. While the idea may be good, it does not alter the fact that in both cases, the people (or aliens) ordering this shutdown in development have the exact same capability as that which they do not want others to have. The hypocrisy of this alien is therefore omnipresent as they do not want us to develop these capabilities (which we are nowhere near having especially at that time) because we "might" destroy other civilizations (that we do not even know exists) or else we ourselves, the entire Earth, will be destroyed. In a sense, the new version is even a plot upgrade from the old one as at least the new one makes more sense. In the new version, we are asked to reform our ways because we are destroying our planet and I suppose, these Aliens are life protectors or something. I personally do not like the moral posturing of the new version. While I like the idea that we should change our ways, I do not understand why the Aliens seem to care about what we do. It would have been a much better idea if the Aliens wanted to annihilate mankind because we are destroying our planet and that if we do succeed in killing Earth, it would cause some cosmic catastrophe of some sort (like a black hole) which would disrupt life on their planet. That would have been less preachy. Back to the 1951 version, Klaatu just wants to talk to the people and say these things and in a sense, he was able to do so in the end. However, there is nothing that would show any resolution to the story. No, it's not not the kind of lack of resolution that makes you think "Hmm... what could possibly happen?" It's the kind of lack of resolution, that makes you think "WTF?" The musical score of this 1951 movie is top notch from start to finish. They always put you in the right mood that seems to warn you of an impending doom which eventually never happens. 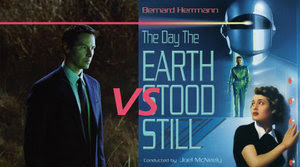 A lot of people think that Keanu's The Day The Earth Stood Still is a bad remake of an awesome film. In truth, 2008 is an okay version of a slightly below average 1951 version. The Day The Earth Stood Still (1951): Three Stars. The Day the Earth Stood Still (2008): Three Stars. At Gunpoint: 2008 over 1951.